Sabrina Perry brings her classical training, fiery fiddle playing, and deep sensitivity to her dynamic and passionate performances and teaching. Since beginning violin at age four in Owen Sound, Ontario, Sabrina has been enjoying a diverse career as both a fiddler and classical violinist, as inspired by her teacher Sandra Swannell. Sabrina holds a Bachelor of Music Performance degree and a minor in psychology from Memorial University where she studied violin with Nancy Dahn. As a classical violinist, she has performed in various chamber ensembles and orchestras across Canada including the Vancouver Island Symphony, Tutta Musica, Symphony New Brunswick, the Newfoundland Symphony Orchestra, and the Georgian Bay Symphony. As a fiddler, she was a member of the Celtic-folk-rock band Beggar’s Road and was often found fiddling, singing, and step-dancing alongside her brother. A passionate teacher, Sabrina has combined her diverse musicality, Suzuki training, and knowledge of healthy bodymapping movements in a variety of settings including King’s Bridge Montessori Preschool, Sistema New Brunswick, Saint James Music Academy, and the Squamish Academy of Music. Her strong belief in the social, emotional, and psychological benefits of music and its ability to change lives led her to become a global leader through the Youth Orchestra of the America’s Global Leader’s Program in 2017. Sabrina embraces all opportunities to become a caring mentor to children and youth through teaching music. She loves designing individualized, fun, and creative curriculum. 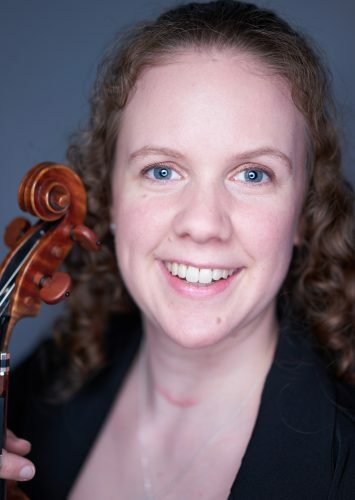 Her goal is to empower students to discover their full potential to be beautiful human beings and healthy violinists with high levels of musical excellence.